Effie's Food Corner | Step into my kitchen! If you want something tangy and sweet that makes your tastebuds dance then these bite size beauties are what you need! They are easy to make and they look fancy and pretty too! * To soften butter, microwave it on the defrost setting for a total of 15-20 seconds, 5 seconds at a time, turning the butter after each 5-second interval. 1. Preheat oven to 200° C (390° F). 2. Grease a mini muffin pan or line with mini cupcake liners. 3. In a medium bowl, combine flour and baking powder. 4. In another bowl, beat the butter and sugar until creamy. 5. Beat in the eggs (one at a time) and the milk. 6. Add the dry ingredients and mix until just incorporated. 7. Put mixture into the muffin pan, filling each cup about ¾ full. 8. 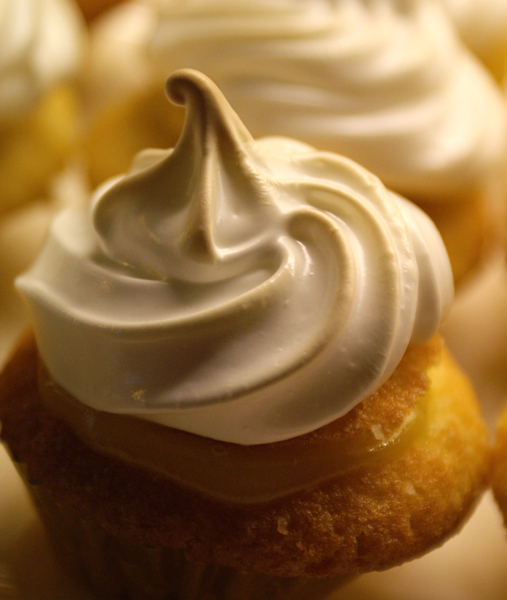 Bake for 10-12 minutes or until a toothpick inserted into the center of a cupcake comes out clean. 9. Allow cupcakes to cool (25-30 minutes) before filling them. 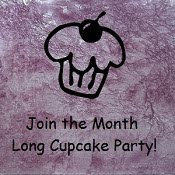 10.To fill the cupcakes, cut out the center of each cupcake using a paring knife and cutting at an angle so that the “lid” looks like a cone..
11.Fill the center with lemon curd and put the “lid” back on. 1. In a large metal or glass bowl, beat the egg whites on medium speed until soft peaks form. 2. Add the sugars and beat on high speed until stiff peaks form. 3. 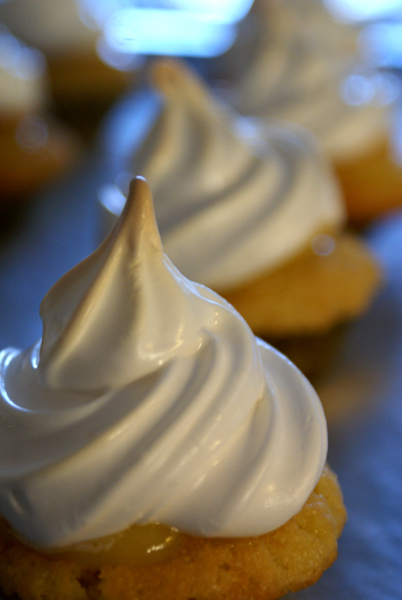 Transfer the meringue carefully into a piping bag and pipe on top of each cupcake. 4. 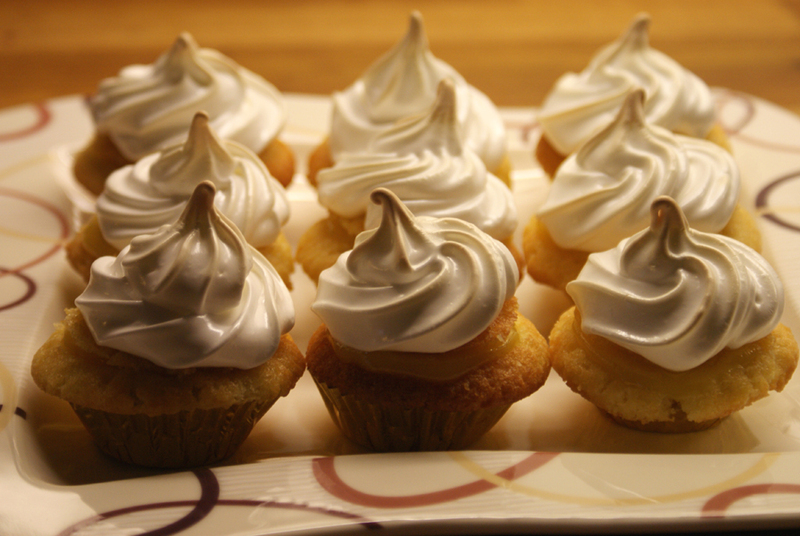 Bake at 200° C (400° F) for 5-7 minutes or until meringue is golden brown. 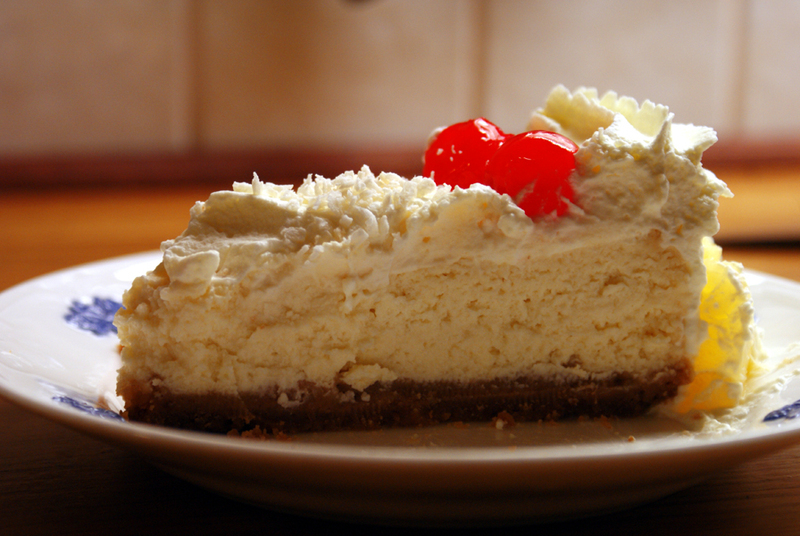 I love cheesecake and I love piña coladas so I decided to combine the two and the result was this rich and creamy cake with a wonderful tropical flavor.. You can make this all year round.. Make it in the winter when you’re missing those lazy days on the beach or in the summer for a refreshing treat! 2. Line the base of a 23 cm (9 in) springform pan with parchment paper. 3. Melt butter in a small saucepan and stir in cookie crumbs and sugar, mixing well. 4. Press mixture into bottom of pan making sure it’s even and covers the entire base of the pan. 5. Bake in the middle of the oven for 10 minutes. 6. Set aside to cool while preparing the filling. 1. Combine cream cheese and sugar using a rubber spatula or wooden spoon until creamy and well-blended. Do not whisk or beat the cream cheese and sugar as this will result in too much air in the batter and cheesecake should be rich and dense, not light and fluffy..
2. Add the eggs, one at a time, gently whisking or beating them into the mixture. Again, do not whisk or beat at high speed as this will result in an airy batter. 3. Add cream of coconut, rum, and pineapple juice.. Whisk or beat gently until well-blended. 4. Carefully grease the sides of the the springform pan and place the pan on a cookie sheet or roasting pan. 5. Pour the filling into the springform pan, covering the cooled cookie crust and bake in the middle of the oven for about 1 hour and 30 minutes. 6. The cake will be wobbly and jiggly when it comes out of the oven, but it will sink and set a few minutes later. 8. Remove the springform ring (run a knife around the sides between the cake and the ring first, to make sure that the cake isn’t stuck to the ring) , cover and chill in the refrigerator for at least 8-10 hours. 1. Beat cream with sugar until soft peaks form and it’s thick and runny… Start off with a low setting on the beater and increase when the cream starts to thicken.. Do not overbeat or your whipped cream will turn into butter! 2. 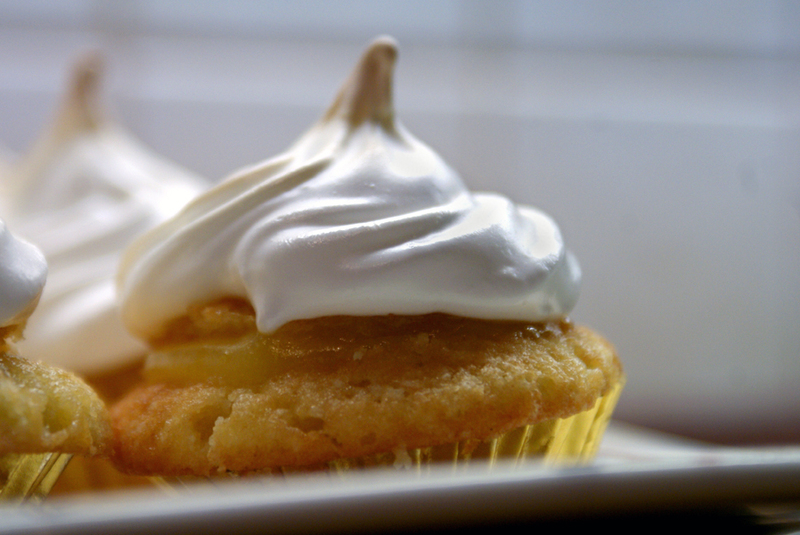 Spread the whipped cream frosting evenly on the cake and garnish with pineapples, shredded coconut, maraschino cherries and some more whipped cream. 2. Bring a pot of water to a boil and cook the broccoli for 3-4 minutes. It should have a nice bright green color when it’s done. 3. Heat corn oil in a large skillet and fry potatoes until golden brown. 4. Put onion, bell peppers, and mushrooms in skillet and cook until tender. Set aside. 6. Drain excess oil and fat. 7. Put the potatoes, onion, bell peppers, mushrooms, broccoli, and half of the bacon in a 30x25x5 cm (12x10x2 in) baking dish or baking pan. 8. Beat the eggs with milk, salt, pepper, and herbs. 9. Add half of the shredded Cheddar cheese to the egg mixture. 10. Pour egg mixture over the ingredients in the baking dish and top with the rest of the bacon..
Soup is such a versatile meal and usually very easy to prepare since it virtually cooks itself…You can easily substitute one ingredient for another or add more or less of a certain ingredient…it’s all up to you really… I enjoy experimenting in the kitchen and soup is a wonderful way of combining different ingredients, and I’m almost always pleased with the results. 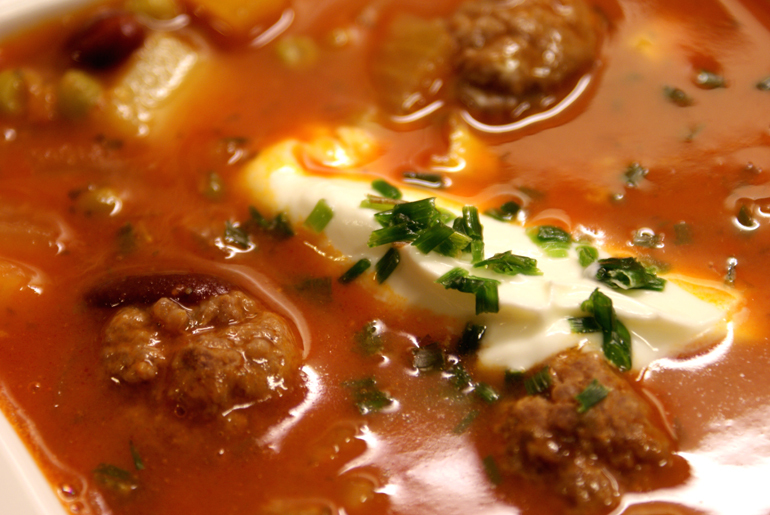 In this case I took your basic tomato/vegetable soup and added mini meatballs to it..I love meatballs, and I love soup…perfect! 1. In a large pot over high heat, bring water, butter and stock to a boil. 2. Add potatoes and reduce heat to medium. 3. Prepare the meatballs by mixing the ground beef with paprika, garlic powder, salt and pepper. 4. 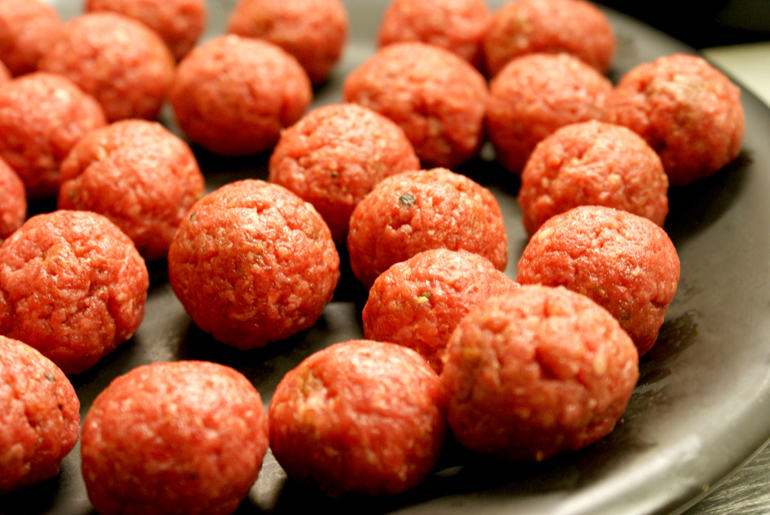 Using your hands, roll the meatballs into 2.5 cm/1 in balls. 5. Put the meatballs into the pot along with the onions, celery, peas, corn, beans, and strained tomatoes. 6. After 20-25 minutes, add herbs and give the soup a gentle stir. 7. Cook for 20-25 more minutes or until the potatoes are tender and the meatballs are cooked through. 8. 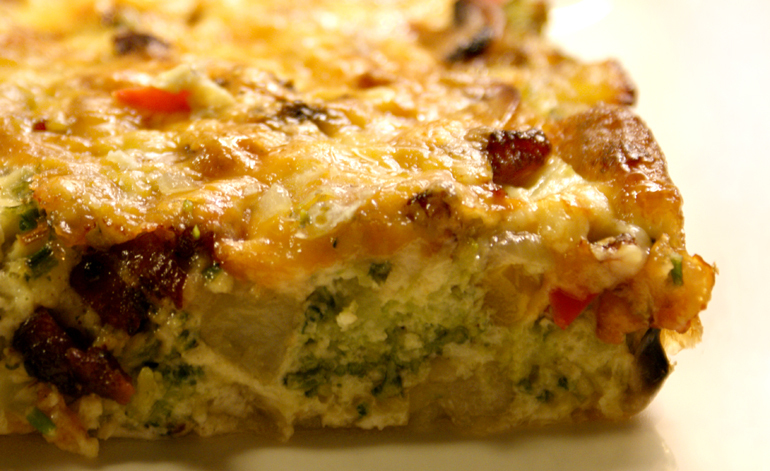 Serve with a dollop of crème fraîche or sour cream in the middle and chives on top. Anyone in the mood for Asian food? Instead of calling your local take out place, you can whip this meal up in no time, and it looks, tastes, and smells great! Plus it’s healthier and MSG-free… Break out your chopsticks everybody! 1. In a sauté pan over medium-high heat, bring coconut milk, tomato paste, seafood stock, lime zest, paprika, curry powder, and chili powder to a boil. 2. Reduce the heat to medium-low and give the sauce a good stir. 3. Add the salmon and simmer for 5-7 minutes. 4. Add salt, black pepper, lime juice, and thawed vegetables. 5. 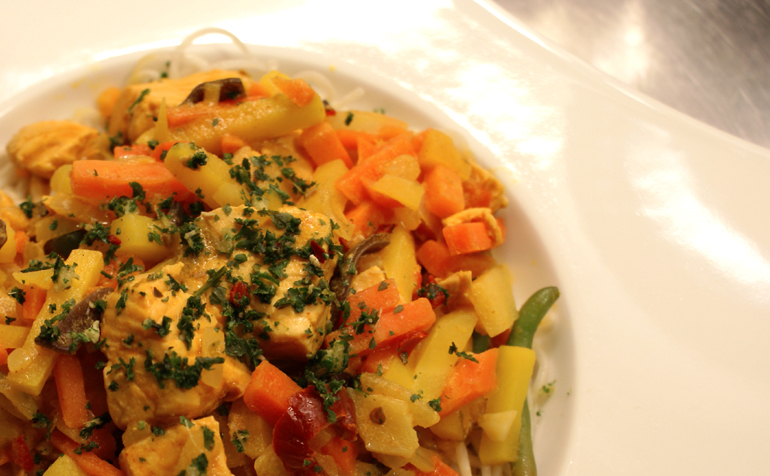 Cook for a few more minutes, stirring gently, until the vegetables are heated through. 6. 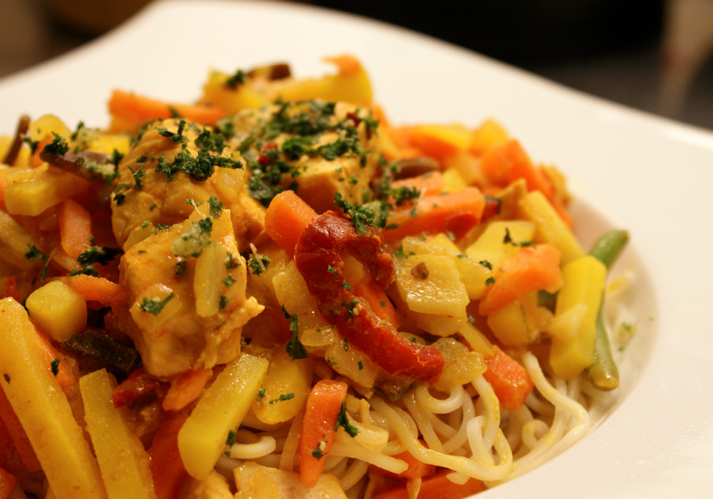 Serve with noodles (or jasmine rice if you prefer). 7. Garnish with coriander, ginger root, and chili.